Cliq your way to reimbursements. 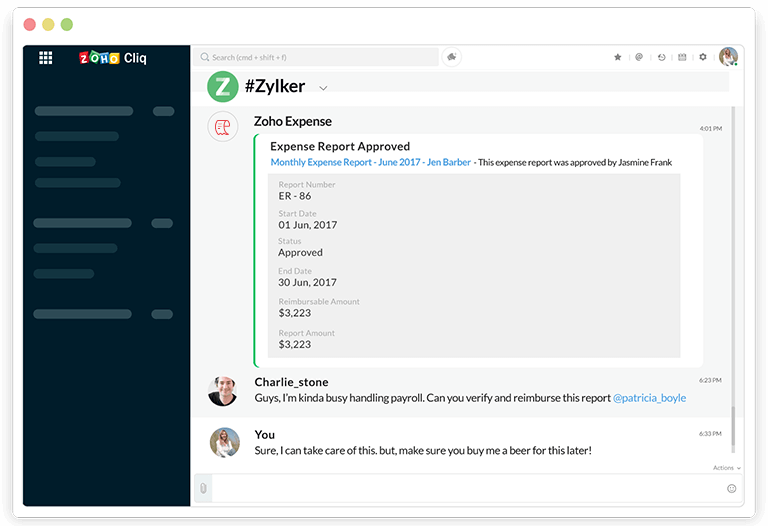 With the new Zoho Expense-Zoho Cliq integration, get notified instantly whenever an expense report is approved or rejected. 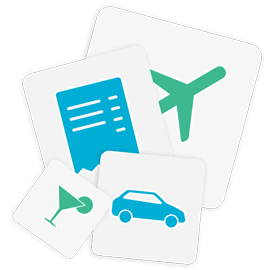 Zoho Expense is a cloud-based application that takes the effort out of expense reporting. With streamlined expense reporting, quick approvals, and instant reimbursements, get your expenses out of the way in just a few minutes and enjoy more time to concentrate on the rest of your business. Delayed reimbursements become a thing of the past. Don't keep your employees waiting for their money. Instant notifications let you process reimbursements as soon as they're approved. Know who you will be reimbursing and how much. 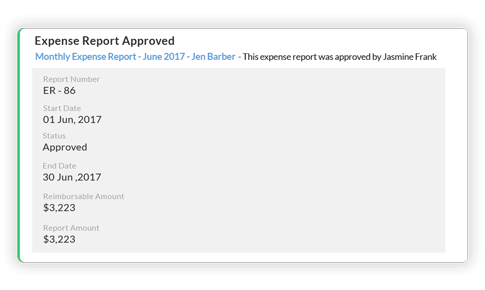 When an expense report is approved, you'll receive a notification in your Cliq channel, with all the information you need to process the reimbursement. Prevent incorrect and duplicate reimbursements. Get notified whenever an expense report is rejected so that you don't make erroneous reimbursements. Log in to your Zoho Expense account. Select the organisation which you would like to integrate with Cliq. Navigate to Admin module on the left and select Integrations. Move to Zoho Cliq and click “Connect now”. Integrate Zoho Expense with Zoho Cliq and click your way to quick reimbursements. Literally.